The Royals finally hit a speed bump at home, dropping its latest series to the Oakland A's. Kansas City lost the final game of the series 5-2, dropping its record at the K to 15-8 this year. The Royals are 18-16 overall, and still remain in second place in the AL Central. 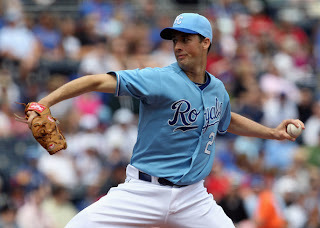 Jeff Francis yet again failed to earn a win, and the Royals starter might hit Independance day before he notches a victory at this rate. Francis isn't pitching terribly, and the Royals had an idea of what they were getting with the veteran. The lefty has a career ERA of 4.79 and an overall record of 55-54, and this season his ERA sits at 5.09. The Royals just need Francis to pitch decently and keep them in games, and he was able to do that in his last start. The Royals offense couldn't get anything going against the A's Tyson Ross, who is off to a solid start this season. Kansas City is off today, and travels to New York to face the Yankees tomorrow. The matchup with the Yankees gives the Royals an opportunity to prove if they are for real or not to the entire nation. Don't hold your breath.